The APRENDER test is the national assessment done in the country to monitor educational advancements. It is carried out annually to students of 3rd and 6th grade of primary and 2nd / 3rd year and 5th / 6th grade of secondary school in order to measure the skills that young people have developed in reading, mathematics, social and natural sciences. In 2017, its second edition took place with the participation of 29K schools and 900K students. Educational quality assessments are a tool widely used in advanced countries to formulate pedagogical improvements in schools. In this regard, it is very auspicious that Argentina adopts as a routine the healthy practice of measuring results. Considering the young in the last year of secondary school it can be seen that 38% do not surpass basic levels of knowledge in language and 69% do not do so in mathematics. 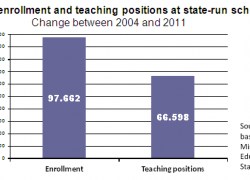 The number of teaching positions in primary and secondary state schools grew by 27% over student enrollment. Teaching salary increased an average of 52% above inflation. 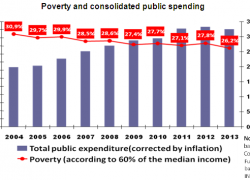 Total spending on public education increased approximately 77% above what the economy grew. 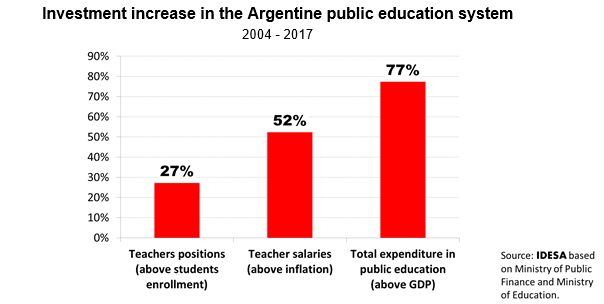 These data show that Argentina has deployed an enormous effort to improve the financing of public education, both in the number of teachers, increases in the real salary of teachers and total spending on education. 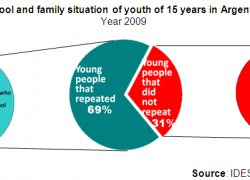 However, the educational deficits are still quite severe: 1 out of 3 young does not have reasonable reading skills and 2 out of 3 young who finish high school do not master mathematics. These evidences are convincing enough in demonstrating that continuing to increase resources to hire more teachers and improve their salaries will not bring improvements in education. To improve educational results, it is essential to innovate in the schools management. The strategies for the socially lagging regions have to be particularly creative, especially in northern Argentina, where learning deficits are more pronounced in part because the socio-economic barriers of those places are more adverse. In any case, there are many international and even regional experiences from neighboring countries, such as Chile and Colombia, where learning has been significantly improved in poor segments of the population. For these achievements is that in the international tests, such as PISA, these two countries surpassed Argentina. In the report of the APRENDER test, 92% of the more than 10K school directors surveyed considered that having received the results was a very valuable input to improve aspects of school life and 82% claimed to have generated actions in their schools based on this information. These are very encouraging facts because they show that the fears and archaic prejudices about evaluation are unjustified. Many of those who work in the educational system want to analyze their results to formulate proposals for improvement. To stop the frustrating strategy of trusting that with more resources the bad results are going to be reversed, a drastic change in the role of the national government is essential. In addition to measuring results, another fundamental federal function is to encourage the provincial authorities to use then as management tools. Likewise, the federal government would make a great contribution in favor of education if it stopped meddling in school management as it currently does by paying part of teacher salaries and financing, episodically and arbitrarily, small repairs and traditional school equipment.